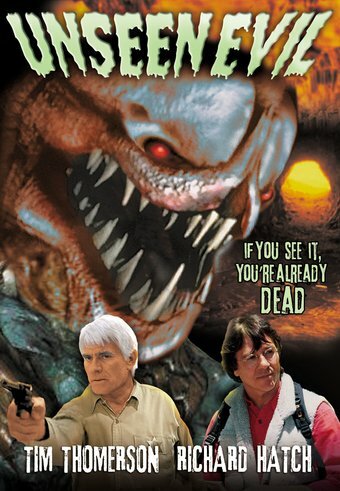 Grave robbers free an ancient alien invader from his tomb in this horror/sci-fi thriller starring cult favorites Richard Hatch and Tim Thomerson. An invisible enemy that defies all Earthly science...and thirsts for human blood! Richard Hatch is best known for his role as Captain Apollo on the original Battlestar Galactica (1978-1979). Tim Thomerson is beloved by horror and sci-fi fans far and wide for the Trancers films (1985-2002), Dollman (1991), and his appearances on genre shows like Quark (1977-1978), The Incredible Hulk (1988) and The Flash (1990). Robbie Rist played Cousin Oliver on The Brady Bunch (1974) and provided the voice of Michelangelo in the Teenage Mutant Ninja Turtles film series (1990-1993). Unseen Evil producer David S. Sterling has been called the new "Roger Corman" of low-budget horror B movies. He has made over 150 films, including Things (1993), Hell's Highway (2002), and the long-running Camp Blood series (1999-present).